being MVP: NEW Tiny Love Developlace™ + #Giveaway! NEW Tiny Love Developlace™ + #Giveaway! My friend Rita received the Gymini® Developlace™ for review from Tiny Love. All opinions are 100% her own. Being a first time mom, I was very eager to get my baby activity toys that promote different development skills. One of the first things that I got was an activity mat; a registry must and a great gift. I actually got two (one for my house and one for Grandma’s when I’m at work). He loved his Tiny Love mats. He loved grabbing the toys, looking in the mirror, listening to the music and tummy time on the mat. As he approaches 6 months, my kiddo is rolling over and beginning to sit up. Just as I began to worry that he’s outgrown his mat and I need to find other methods of helping his development and entertaining him, Tiny Love has come to my rescue again. They’ve taken their classic Gymini line one step further with the new Gymini® Developlace™, which is perfect for my growing kiddo. 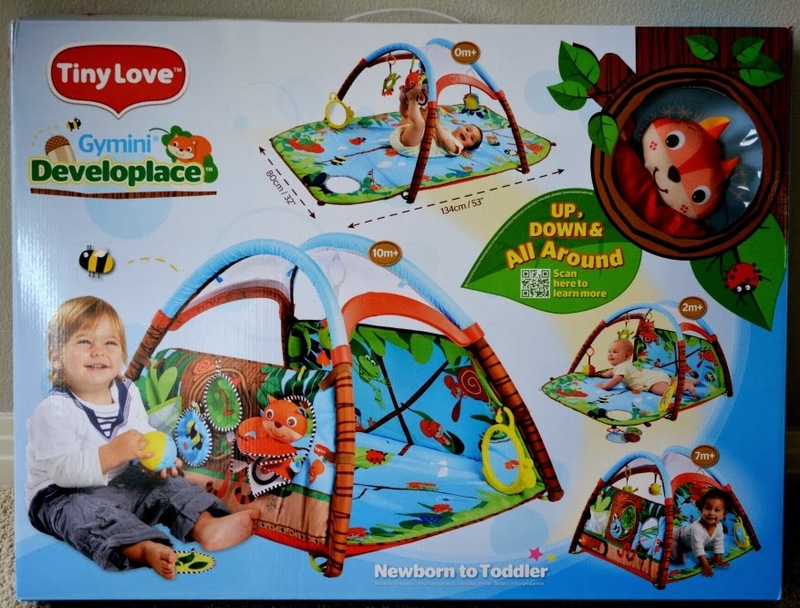 The Gymini® Developlace™ is a chic and adaptable activity center ($79 + free shipping) that converts from a floor mat to a crawling tunnel, keeping little ones entertained from newborn to toddler. With easy set up instructions we were ready to play within a couple of minutes. As a floor mat he is still able to lie on his back and grab at the vibrant hanging toys. All the toys can be re-positioned so playtime continues to be exciting and stimulating. He loved his new mat and quickly began reaching and tugging his new toys all around the mat. The mat walls easily fold up with simple Velcro hooks to allow for more activities. 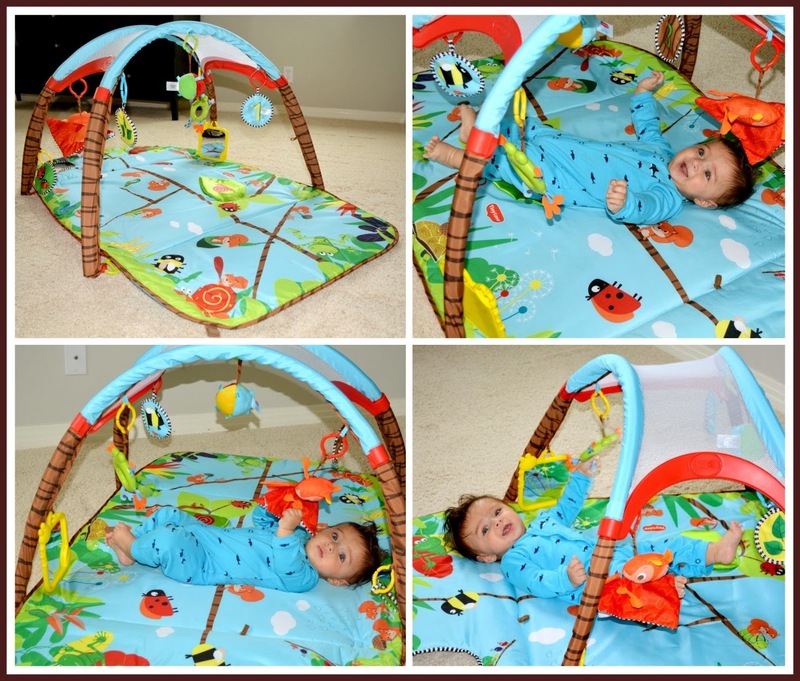 The mat’s bold graphics, different toys and peek-a-boo window help prolong tummy time. 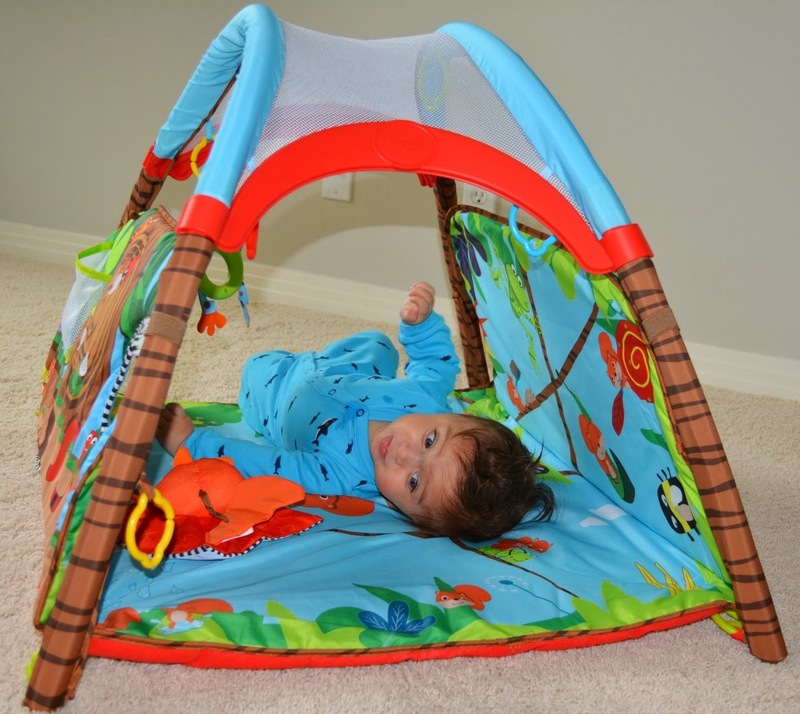 With his new ability to roll over my kiddo hardly would stay on his tummy, but with this peek-a-boo window, he loves playing and laughing helping him to exercise his back and shoulder muscles. The peek-a-boo window also doubles as an activity wall. Although, my little guy is just learning to sit up, with assistance, he loves grabbing the mat and sitting with it as I try to show him the different activities. After babies are able to sit up independently, the activity wall promotes other motor skills and development stages with drop play and 1-2-3 soft cards. The balls that hung over him when lying on his back can be removed and used to play with on the activity wall. I can’t wait till the day he is able to place the ball in the netted pocket and set the playing cards in the correct location on his own. The mat is not only great for development of motor skills, but it also is great as an educational toy. The soft cards have animal designs on the other side that infants learn to match up with the Velcro dart board. It may be hard to see since my kiddo needed so much help but he was very into grabbing the ball and dropping it into the window as well as putting the crunchy cards onto the Velcro wall. The versatility of this mat seems limitless as it adjusts to developmental skills. The folded up sides also create a tunnel to encourage infants to crawl. Thanks to the extended tummy time in the floor mat position, my kiddo is strengthening his muscles to prepare him for crawling. When babies are able to move and crawl, passing through the tunnel will keep them busy and amused. While my baby seems to be a little far from that step, you can see that one day I hope he starts crawling through this cute tunnel instead of lying on his back. The multiple ways that this one mat can be used to grow and adjust with a baby’s development is ingenious. The simplicity of the design and ease of transition between all the various activities is remarkable. Tiny Love truly solves the needs of parents and children in a creative and playful manner. I recommend this mat to any parent who is shopping for perfect ways to entertain their children and help them develop essential skills. One winner will Receive the Tiny Love Developlace! I like the 3-in-1 Rocker Napper - Red, and I would like to win this play mat for my baby due in Aug. I like follow me fred. My couisn would love this! She just had twins 2 weeks ago. I like the 3 in 1 rocker napper. Would love to win this for my pregnant sister in law. The 3 in 1 rocker napper looks great. I'd like to win the play place because I'm pregnant and I don't have a play mat of any sort yet. I would like the magical night mobile. I like the 3 in 1 rocker napper. I would love the Developlace for my 3 month old! I like how versatile it is! Another great item is the Soothe N Groove mobile. I like the 3-in-1 Rocker Napper and I would like the developlace because I don't a a baby gym yet. I'd love to have the 3-in-1 Rocker Napper - it would come in so handy at our house! I also would love to have their Gymini Bouncer. I would love to win their new Developlace for my new grandchild who is due soon! This looks like an amazing play mat. i would love the 3 in 1 rocker napper and this because you can use the developlace until 18 months! I'd like to win this for our new little boy. He'll be here in April. I also like the Follow Me Fred toy. I think my daughter would like playing with it with her new baby brother. I'd also love to try Tiny Love's 3-in-1 Rocker Napper! I'd love to win the Developlace because a friend of mine is pregnant with her first baby and it would be a great baby shower gift! I love the take along bouncer too. i would love this for my soon to be born nephew. It looks great! I also like the 3-in-1 Rocker Napper - Flow! I'd love to win the Developlace for my niece who is due next month. follow me fred... I like that this can be a little fort. love the Magical Night mobile! and i would love to win this for our baby because i love that it can be used from newborn to toddler and has various ways to use it! I like 3-in-1 Rocker Napper, and I would love to win the new tiny love developlace because we're expecting our #2 baby, and it'd be very useful for us. Thank you for the chance. I would love to win the Developlace for my 3 month old grand baby. She is at the perfect age for it and would help with her development. The "Follow me Fiona" toy. My daughter is just learning to crawl and that'd be great. I love this would be great for a friend who just had a baby since these (for whatever reason) freak my daughter out lol. I would also love to have the Gymini® Bouncer. Thanks so much for the fantastic giveaway! I also love the 3 in 1 Rocker Napper. I would love this for my newest niece or nephew! I love Follow Me Fred and Fiona!! I would love to win this for my little guy who is due in May! I really like the day and night baby soother, I would love to get the developlace for my best friend who has a baby on the way! The take along bouncer is great. I would win this for my cousin who is pregnant! I'd like the 3-in-1 Rocker Napper for my fourth baby due any day now. I'd love to win this playmat for her too, because I don't have one anymore and it would be great for keeping her entertained while I tend to my other children at times. The Developlace looks perfect for our newborn due in July. I also like the design of the 3 in 1 Rocker Napper! I would love the Musical Stack and Ball game for my daughter, I think she would really love this! I love that 3 in 1 rocker napper! so comfy looking! but i really like the images and detail on this playmat! I love the 3-in-1 Rocker Napper from Tiny Love. Looks perfect and functional for the little one. The 3 in 1 rocker Napper is a great product too. I would like to win the mat for my stepdaughter who has a second baby on the way. Thanks for the chance! I would like to try the 3-in-1 Rocker Napper - Blue. I would like to win for my baby. I would love to win this for my friend who is due next month! Another item I would love is the Magical Night Mobile! I like the 3-in-1 Rocker Napper - Flow and I'd love to win this for my niece who is due to make her arrival any day now! I like the Follow Me Fred! I'd like to have the Developlace for my friend who's expecting! I think Follow Me Fred is so adorable! I also think the Developlace is a genius idea. Babies outgrow playmats so quickly, but this design allows baby to grow with it for a little while longer! I would like to have the Tiny Princess™ Gymini® Bouncer. I want the develope place cause my son needs to have some alone time and needs to learn how to entertain himself for a few minutes. I also love the Take-Along Mobile and Sunny Stroll. We'd love the Gymini Developlace because we're due with our first child in just a couple of months and would get a ton of use of it! I love that it would grow with our baby and could be used for quite some time, unlike most activity gyms that can be only be used for a short period. The rock and ball seems awesome- I loved tambourines when I was a kid. I'd love this play mat because it would be useful for a while. i like the take along bouncer and i just found out we are expecting #2, so thats why i want this. I like the take along bouncer, I would like to win this because my granddaughter would love it. I would love to have their rocker napper! This would be either for my future kids or for a friend's little one. I LOVE the 3 in 1 rocker napper. I would love this for our family! 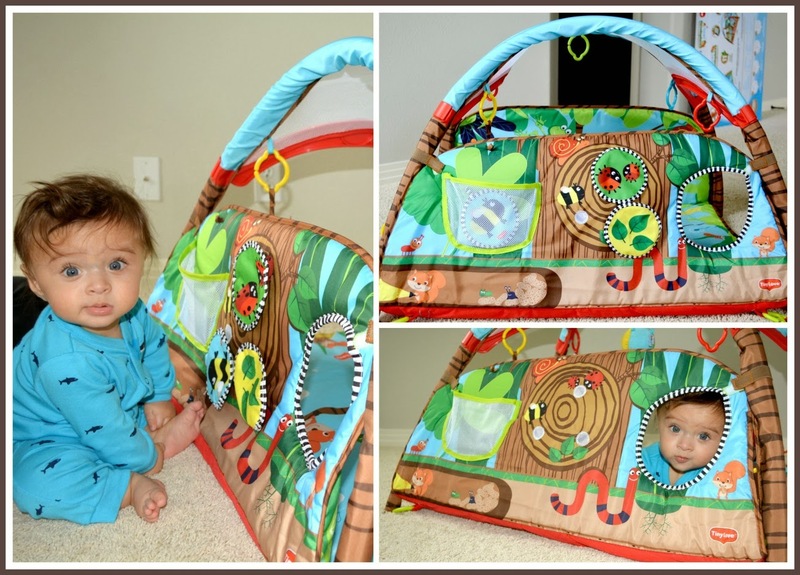 I like the Gymini® My Nature Pals and I would love to win this for my 5 week old grandson. 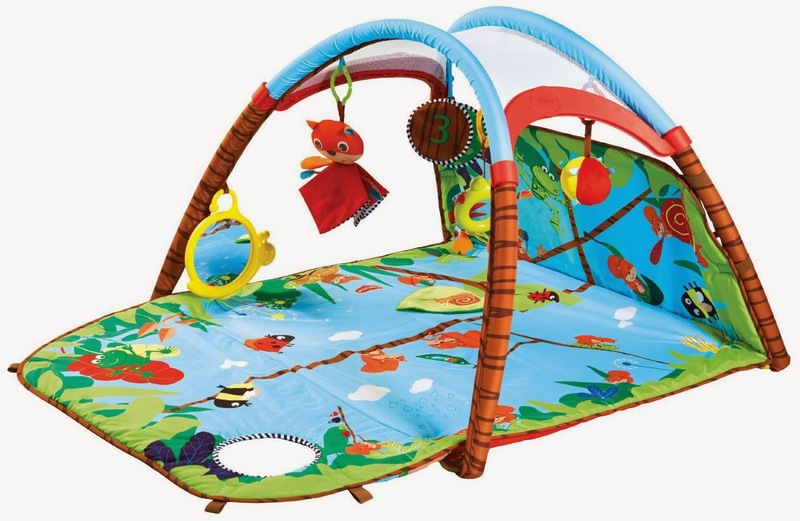 I also like the My Nature Pals Mobile and I would like this for my niece, to entertain her. 3-in-1 Rocker Napper and I want to win this for my newborn nephew! My 3 month old would love a play mat! I also love the Follow Me Fiona from Tiny Love. They have adorable toys!